We saved on the bridal shower by borrowing an old-fashioned suitcase, buying this globe on eBay and putting up an old map to highlight the travel theme. In the next five months, I will be attending four weddings. And I'm a bridesmaid in two of them. Yes, they're fun and I get to be part of a momentous occasion in my friends' lives. But attending weddings is an expensive affair. I knew I was spending quite a bit, but had no idea that it was costing me a fortune until I started calculating my finances for this story. Turns out, I am spending over $1,000 for just one of the weddings. Yes, you read that right ... just one. Apparently, I'm not the only crazy person. Most twenty-somethings are in the same boat. It's not uncommon to drop $1,000 as a bridesmaid or groomsman, said Jamie Miles, managing editor of The Knot. In fact, just attending a wedding is pretty expensive -- costing an average of $673 per wedding guest, according to an American Express (AXP) study. Don't get me wrong, weddings are a lot of fun and I'm usually the first one on the dance floor. I was pretty smart on some of my spending, but there are ways I could have shaved costs at every turn. Here's how much I am spending, and tips from experts on how I could have saved. We ordered these online, but try making them yourself if you're not pressed for time. My co-bridesmaids and I each plunked down this much for a jam-packed weekend in New York City. We took a pole dancing class (where we all wore matching "Team Bride" t-shirts), saw a musical called "Naked Men Singing," went to a wine bar for dinner, hit up a club later that night, and enjoyed brunch the next day. Yeah, some of this sounds like a big cliché, but the bride and all of us had an awesome time. Still, we could have done better by hunting around for deals. Sites like Groupon (GRPN) offer pole dancing classes at fun venues for much cheaper, said Jen Glantz, who runs a company called Bridesmaid for Hire. We could have tried the same strategy for dinner and brunch, and asked for a cheaper group rate on any of the other events. My friend, the bride, found a beautiful Vera Wang dress for a good price. And she bargained with seamstresses to get the lowest quote. 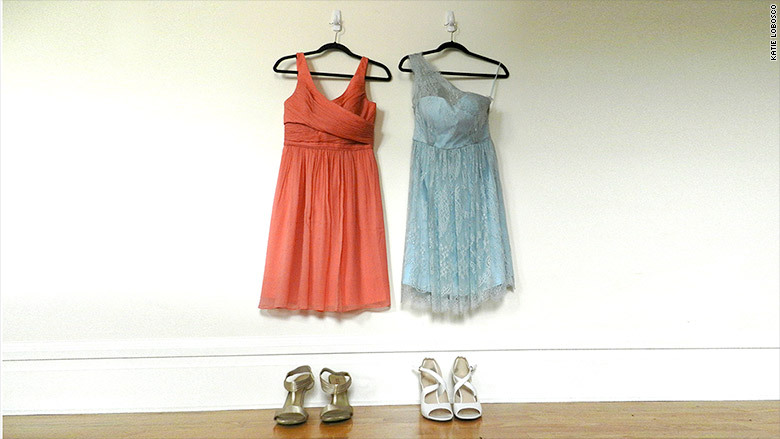 While my Vera Wang gown is still at the seamstress, these two bridesmaid dresses are awaiting two other weddings. Worth a splurge if you're the bride. For me, I won't ever wear this dress again. What I didn't know is that there are websites like Vow to Be Chic and Rent the Runway where you can rent your bridesmaid dress. Many cost around $100. That works well if you don't have to wear a specific dress and the bride instead picks a color, where everyone just wears the same shade. I had to alter my dress -- it was about a foot too long. But Glantz says in general to hold off on alterations unless they're absolutely necessary. "Maybe you can wear really high shoes instead of taking up the hem," she said. We went to town on this one, fully embracing our inner-Pinterest. 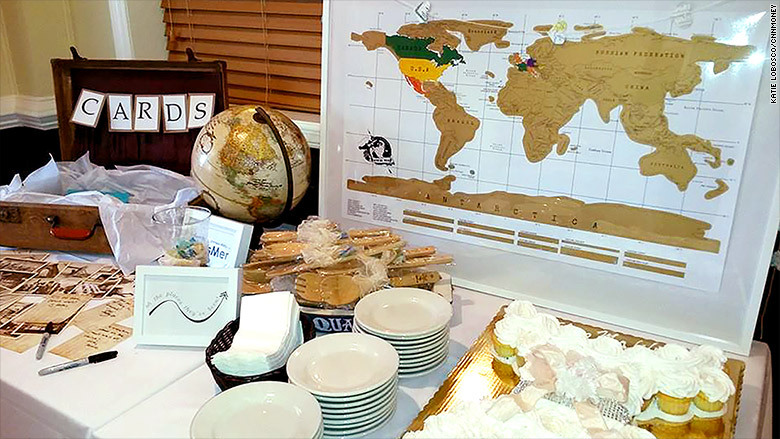 The bride and groom are big world travelers and so we chose a travel theme for the bridal shower. I have to say we were pretty innovative and kept costs down here. We bought an old globe on eBay (EBAY)for $10 and used it as a guest book for people to leave messages on. We got a map and colored in each country the bride and groom have visited. 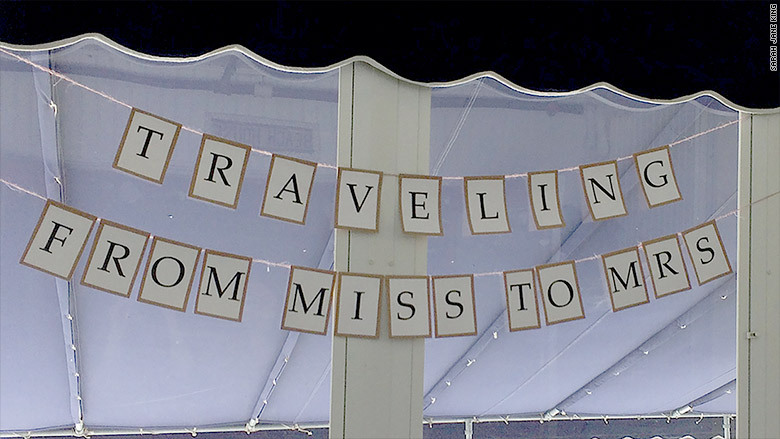 My co-bridesmaids and I channeled our inner Pinterest to make these for our travel-themed bridal shower. Not known for my crafting abilities, I surprised myself by cutting hearts out from old maps and strung them together with twine to hang on the walls. It looked great! We also put framed pictures on each table of the happy couple at different places they'd visited. An old-fashioned suitcase was left open on the table as a place for guests to put cards. 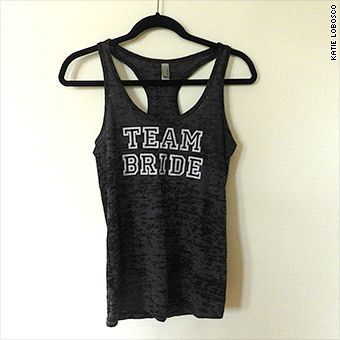 We borrowed it from another bridesmaid's brother. But we probably could have borrowed more from other friends who are throwing similar showers. Now that the shower is over, I'm stuck with 12 vases that we used as centerpieces! Some brides want some uniformity among the main players in the wedding party, so they suggest the same hair and makeup place. But let's face it, I'm not the bride, who everyone's going to be looking at. I asked her if I could do my own makeup and she was totally OK with it. That will save me about $95. I got to the registry early on this one and found a shower gift exactly in my price range: gold-plated serving utensils for $75. In the past, I've waited too long and was left with few choices: usually something too inexpensive (a $5 cookie cutter) or too pricey (a $300 mixer). The bride is such a close friend of mine that I'm more than comfortable with what I'm spending. But to keep the grand total from being a shock after you've bought gifts for all the events, figure out your grand total in the beginning, suggests Miles, at The Knot. She suggests budgeting 20% for the engagement gift, 25% for the shower gift, 5% for a gift at the bachelorette, and 50% for the wedding gift. I got lucky that the wedding venue is close to where a favorite aunt and uncle live. I'll stay with them the night before the wedding. On the night of the big event, I'll stay at a hotel where the bride and groom reserved a block of rooms. By booking early, I got a discounted rate.